I liked Belinda Bauer’s first two books, but this is not good. Part of that is down to me and my particular tastes in crime fiction – but not all. It starts promisingly: children are disappearing from cars and notes are left in their stead. The drama, the mystery, the evocation of the countryside and the rural community was working very well. And I was pleased to see the return of Detectives Reynolds and Rice. I probably would have got past it, if only Belinda Bauer hadn’t brought back two characters from earlier books and put them through the mill again. Investigators, criminals, locations can return over and over again, but to have the same lives turned upside-down by crime over and over again is too much. Stephen Lamb had nearly fallen victim to Arnold Avery and had been horribly affected by the uncaught murderer. He was sure he knew who the killer was, but he couldn’t prove it and he knew he would not be believed if he spoke out. And village policeman Jonas Holly had been bereaved and left horribly traumatised by the same murderer. Jonas wasn’t in any state to go back to work, let alone be part of a major investigation, and what Stephen and his poor mother have been put through over the course of three books defies belief. I put my concerns to one side, because the mystery was intriguing. But then a flashback gave the game away. I knew who the kidnapper was and I had a fair idea of his motivation was. After that the story followed both victims and investigators to a grand denouement. It all felt a little excessive to me. Such a pity because Belinda Bauer does many things rather well. The Lamb family – their lives their relationships – are drawn wonderfully. Stephen and Davey in particular are wonderful characters, and I love the way their lives are moving forward. There are small details caught perfectly and big set-pieces handled beautifully. She clearly knows the countryside, understand how village work. And she handles mystery and suspense really well. But too much was sacrificed to the big drama. The most significant sacrifice was Jonas’s character: it was all over the place and the answers to the questions left unanswered at the end of the last book weren’t really satisfactory. Others have liked this book more than me, so maybe I’m looking for something different in a crime drama. Something not quite so dark, something driven rather less by plot and rather more by character. But the consensus seems to be that this isn’t as good as ‘Blacklands’ or ‘Darkside’. 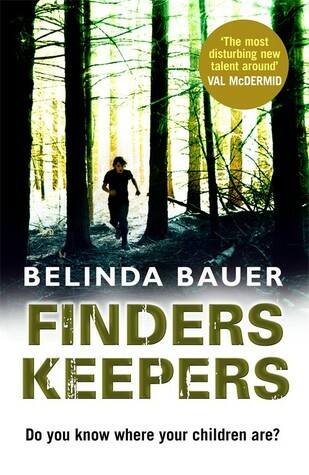 I’m hoping now that this is the end of a trilogy, and that Belinda Bauer will move on to something a little different. It’s disappointing when it’s an author who has written much better books. But these things happen. I’m sorry that this was a bit of a let down for you. I’m working really hard to not starting any new trilogies this year. I have a few that I need to finish up and one to start because they’re sitting on my shelves. This wasn’t marketed as a trilogy, but there are more links than you see usually in crime series. I should think about catching up with series and wrapping up sequels and trilogies too. I enjoyed both Blacklands and Darkside, so I’m sorry to hear you were disappointed with this one. I would still like to read it, but I think I’ll look out for it at the library rather than buy it. This is much weaker than the other two books I’m afraid. Still readable, but there are problems. So I’d certainly say one to borrow. Excellent review. I read/reviewed the book for Euro Crime and although I think the author certainly can write in a way to draw you in, I found it disappointing. (1) too many murders/abductions in one small village over 3 books (2) too many dramas for the same 2 characters (3) unlike you I found the detective flat and tedious (the hair thing just seemed to be “tacked on” (ha ha) to make him interesting in some way – it didn’t (4) the detectives didn’t actually have a role in the novel (5) the criminal’s ability to do what he/she did was unbelievable (6) the motivation was incredible (7) disgusting descriptions of kidnapped child victims, as if them not seeming to be unhappy somehow reduces the voyeurism of it all (7) as you say, the plot is revealed half way through so if you are not into it by then, the rest is pretty tedious. I actually like a low key detective sometimes, but otherwise I completely agree with you. I just lost the will to write at any more length. Great review, I really struggled with this book and I agree not as good as her first. I have yet to read Darkside. I felt like Belinda wanted to write something more, but was forced into it through publishers? Perhaps that is why there was a lot of repition? You really should read Darkside – I loved it apart from the ott ending. You could be right about the pressure to write a particular book to a particular deadline, but it still bothers me when the psychology of established characters goes wrong.